Our condo is located in the Coal Harbour area of Vancouver, overlooking Burrard Inlet. Click here for some of the breathtaking views we are treated to at the condo. Our journey to Vancouver began with a New Year's 2005 vacation to Sooke Harbour House on Vancouver Island and the city of Vancouver. We were so enamored with the city, that we were back 3 months later looking at condos. We found a very unique place in the Coal Harbour area of the city. Our unit, located on the second floor, includes a 250-degree view of both the waterfront and city, with a great perspective of activities on the seawall and waterfront below. Directly in front of us is the Coal Harbour Marina, a popular place for large yachts visiting Vancouver. We also enjoy views of the cruise ships leaving the inlet on their way to Alaska in the summer, sharing space with the sea planes, pleasure yachts, rowers, container ships, tour boats and ferries ... a very busy waterway. A majestic line of mountains spread across the horizon, towering above North and West Vancouver, including Grouse Mountain, a popular skiing destination with a gondola that provides spectacular views of the city. We are a few minutes walk to Stanley Park, a 1000-acre park with a 5.5 mile seawall that is one of our favorite biking destinations. Vancouver has captured our hearts, and many cities in the United States could learn a lot from Vancouver's practices ... it's a very live-able city with a huge residential population, enormous green areas, a commitment to sustainability and public art. Not long after falling in love with the city, we also realized we wanted to boat here ... and our quest began to find the right boat. 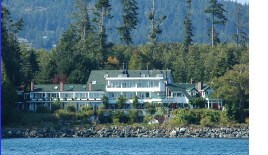 Some photos of Sooke Harbour, one of our favorite New Year's destinations. Beyond its cozy rooms, its restaurant features ONLY local ingredients from the Island ... an international award winner! 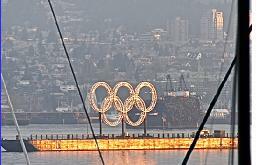 The 2010 Winter Olympics have been a focus for Vancouver since we first bought our condo here. We look forward to being in the city for the games, and have enjoyed watching the city prepare for this amazing event.